Partner of glass curtain wall.As long as there are glass place,it can be applied. 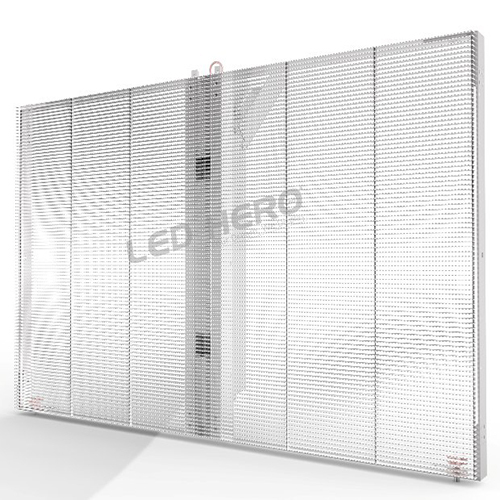 The LED curtain wall screen is similar to normal led display,they are all self-luminous display.In terms of product materials,the transparent led display was used aluminum cabinet and ultra-thin PCB board,it can be blended perfectly with the surrounding environment.We can’t see basically any supporting structure from far,and we can see the indoor thing by the glass;In the product structure,the transparent led display was combined with the principle of the structure of the blinds,through the light bar flat produce the the gap to form a transparency,it will not affect the indoor lighting,when it was lighting,it can play the picture and the video and the other dynamic advertising information. The normal led display can’t be used in a big area of glass wall,because it was restricted by the weight,transparency and the outstanding appearance.However the LED curtain wall screen solved perfectly this question,due to the transparent let display with the features of high transparency and ultrathin. There are obvious technical advantages in the field of architectural media. It is a new blue ocean field.This field included business building,shopping mall,car shop and the kind of glass wall occasion. Commercial mall is a place where people big, transparent led display have acool way to show , and high transparency, high stability. It does not affect the original architectural style and indoor daylighting and watch the line of sight after the installation, but also have the effect of lighting glass building, promote its commercial value, play a good advertising effect. The transparent present translucent visual effect during the daytime,good daylighting can see the blue sky and white cloud;it can play the beautiful video at night.With the wonderful sound effects,it can bring stunning visual effects.It can come true variety curved shape by flexible structure design.The high transparency installation can create difference sky and immersive situation.